October 16, 2015 By This post may contain affiliate links. This post brought to you by Campbell Soup Company. The content and opinions expressed below are that of Hungry Happenings. 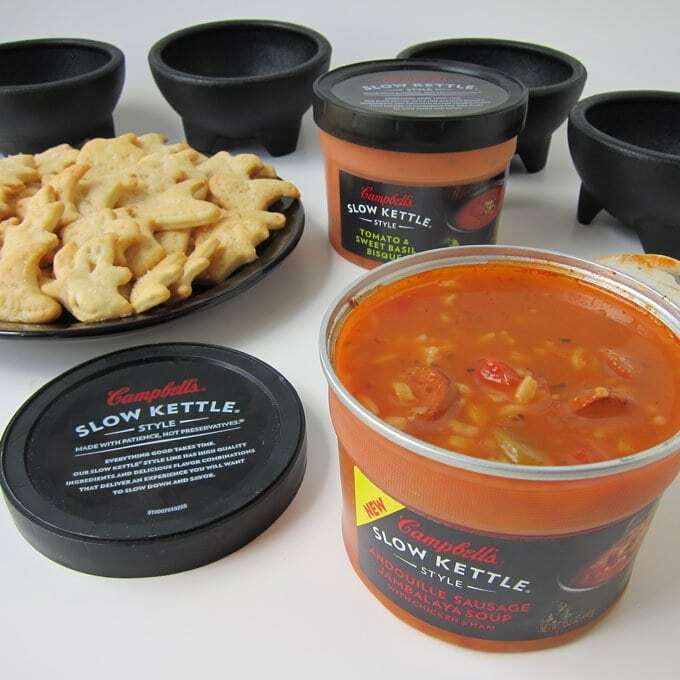 Serve up some fun at lunch by topping a bowl of Campbell’s® Slow Kettle® soup with crispy Homemade Halloween Crackers. My friends stopped by today to help make more Halloween treats for our party and I wanted to serve them something fun for lunch, but didn’t want to spend hours cooking, so I grabbed a few containers of Campbell’s® new Slow Kettle® soups and served them in cute salsa bowls that look like cauldrons alongside a plate filled with Halloween crackers and a salad. I wanted to make something hearty, that would keep them filled up so they didn’t spend all afternoon eating the treats we need for the party, and the soup, salad, and crackers did the trick. I grew up eating Campbell’s soup and even into adulthood enjoyed the convenience of opening a can, heating it up, and enjoying it with my meal. Over the years, though, as I learned to cook and enjoy the taste of freshly prepared foods, I bought fewer cans of soup. I still want the convenience of quick and easy foods to prepare, especially at this time of year, so I was excited to find out the new Campbell’s Slow Kettle® soups where created by chefs who packed them full of fresh ingredients like Portobello mushrooms, angus beef, Andouille sasuage, asiago cheese, and Madeira wine. Those aren’t items I’d expect to find in soup sold on a grocery store shelf. Would you? 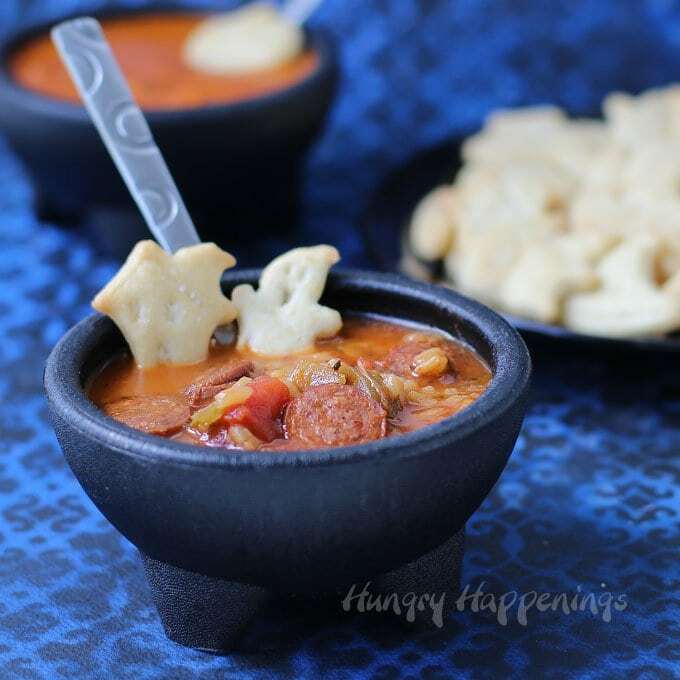 We tried Andouille Sausage Jambalaya Soup and Tomato and Sweet Basil Bisque and were thrilled to find they taste like they were homemade. 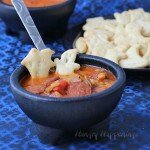 Look at those big slices of Andouille sausage in that soup. they are almost as big as the ghost and haunted house crackers. My friends who like spicy food, loved this soup. I preferred the thick creamy tomato soup filled with chunks of real tomatoes. It had just the slightest bit of heat, but that was balanced by lots of fresh cream. I’ve never tasted a better store bought soup before. I’ll definitely be adding this to my grocery list from now on and am anxious to try the Portobello Mushroom & Madeira Bisque and the Angus Beef & Dumpling Soup. Don’t those sound amazing? These are just a few of Campbell’s new products that I look forward to trying. They have many more, so be sure to check them out to see which flavors you might like to try. After lunch my friends where full and happy. We got to work making all sorts of Halloween treats. They liked the homemade crackers that I served with the soup so much, that we even made more to serve at the party. We used plunger cutters shaped like pumpkins, ghosts, haunted houses, and witch hats to make the festive crackers. Plunger cutters work great for these crackers because they cut the dough easily, leave an imprint on them, and the dough doesn’t stick. When you make your crackers, be sure to roll out the dough as thin as you can and cut the shapes as close together as possible, so you use as much of this dough as possible. You can re-roll the dough, but the crackers made from that dough will bake up thicker and smaller than the ones baked from the first rolling. I suggest you cut the dough in half, roll out half on a silicone mat, cut out as many shapes as you can, remove the excess dough, poke holes in the crackers, so they bake flat, then bake them until golden brown and crispy. Then you can roll the second batch of dough and repeat the process. I got 6 dozen crackers out of the dough, then made another few dozen out of the scraps of dough. By cutting them directly on a silicone mat, all you need to do is remove the excess dough, transfer the silicone mat to a baking sheet, and pop them in the oven. That way you don’t have to lift the dough and stretch it out of shape. The crackers wont spread so they can be really close together. When they come out of the oven, brush them with melted butter and add some salt then serve with a bowl of hot Campbell’s® Slow Kettle® Soup. Buttery homemade crackers shaped like pumpkins, ghosts, haunted houses, and witch's hats. Combine flour, baking powder, sugar and salt in the bowl of a food processor. Add butter and pulse until the butter breaks up into pea size pieces. Add the oil and pulse until well blended. Turn on the food processor and slowly pour the water in through the feed tube. Add just enough water for the dough to form a ball. Remove dough and cut it in half. Roll out on a silicone mat until the dough is as thin as you can get it. 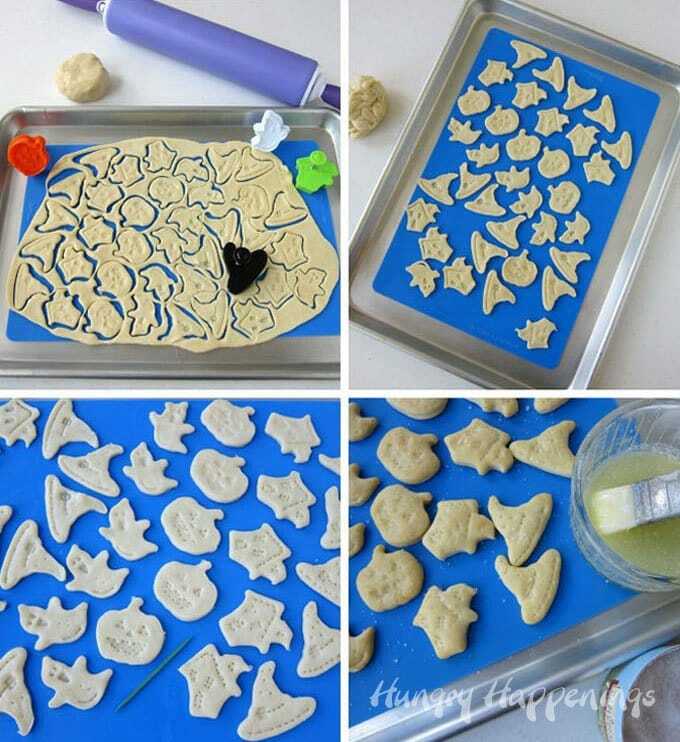 Cut the dough using Halloween plunger cutters. Set the silicone mat on a baking sheet. Poke holes in crackers using a toothpick. Bake crackers for 10-12 minutes until golden brown and crispy. Remove pan from oven and immediately brush crackers with melted butter and sprinkle with some salt. Repeat using the other half of the dough. If you want you can re-roll the excess dough and cut more crackers. Recipe adapted from The Cupcake Project. 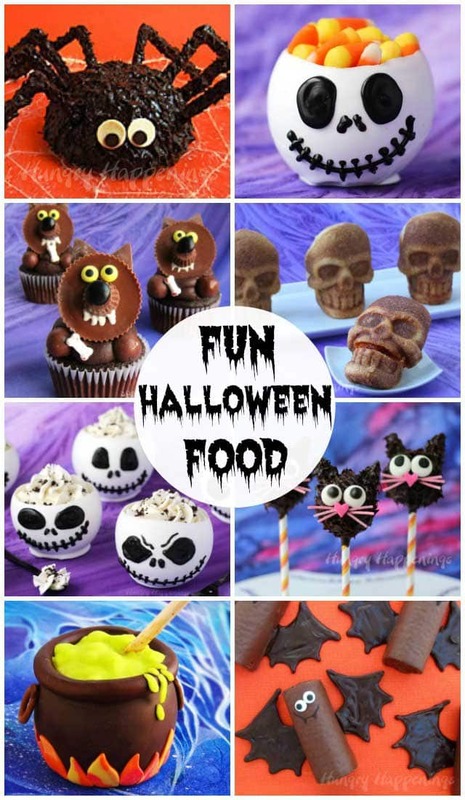 Find more festive Halloween Recipes by clicking this link. I was given product samples and compensated by Campbell’s Soup Company in order to create and share this fun Halloween idea with you. Be sure to check out other delicious Campbell recipes at Campbell’s Kitchen. You can follow Campbell’s on Facebook and Instagram @Campbells. Absolutely the perfect compliment for the yummy soup! !